With comics you have to be flexable…change is inevitable. 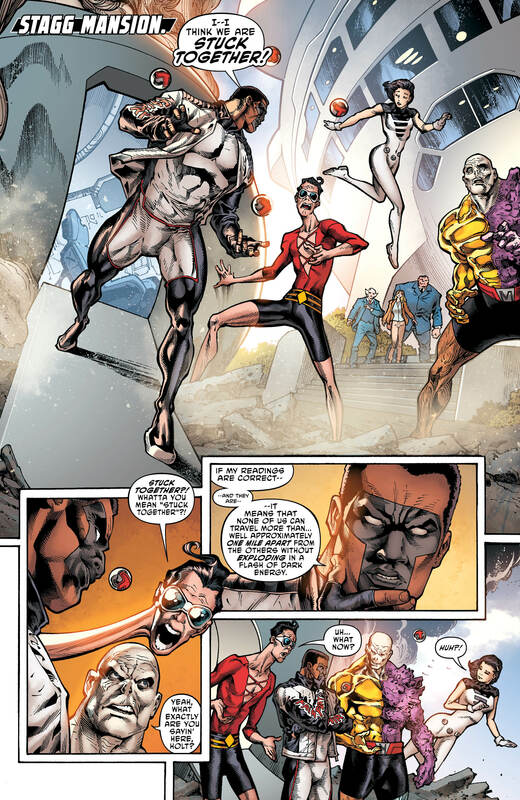 The Terrifics is an interesting team-up of Mr. Terrific, Metamorpho, Phantom Girl and Plastic Man. The last issue showed us that characters are bonded together due to some dark matter mix-up. So what happens when your bonded with Plastic Man and your home happens to be Simon Stagg’s place? Our unusual quartet faces THE WHEEL of DOOM. Classic DC…or too classic. The stranger pairings of this group make the story fun and entertaining, but it feels like things that DC characters normally do. If your going to take the characters out of the box, then make them do something out of character. Metamorpho’s relationship with his girl friend Sappire hasn’t really moved past what we’ve seen twenty years earlier. There’s a subplot which sort of involves one of our cast members but we have to wait for that. Ivan Reis’s switch to Sandra Hope & Jamie Mendoza isn’t too painful a switch as artists go. The Plastic Man has some fantastic thick lines, which gives old PLAS further character. He’s usually not the same shape twice and has the excitement we expect of the character. The New Age of Heroes is DC’s way of mixing things up in their universe. I’ve enjoy this series so far, so I hope it continues to stretch our imagination.